Kelli was picked as Superstar Student for February! WTG Kelli Belly! 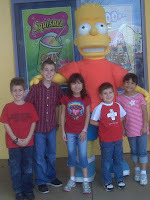 Bart Simpson stopped for pictures at Universal Studios. The kids love the ride and was thrilled to take a photo with Uncle TJ's "idol". 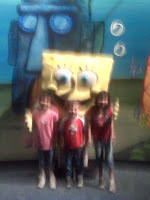 Don't adjust your computer screen....I Ms Kodak forgot my camera at home and had to use my cell to take Spongebob's picture. Just think he does live under the sea! Nicholas had a fun time with his family and friends at Sunlight's God's Colorful World event. Sal recieved a Sunshine Math Award at school, he has 102 stars in math problems. WTG Sal! Boys vs Girls Pizza Madness! Nicci's Nest along with Growing Up Garcia and Mommy's Joy of Life took 11 kids out to dinner. It was boys vs girls in a pizza eating frenzy! Mac and Cheese Pizza, Hot Wing Pizza and Loaded Baked Potato Pizza filled up our hungry bunch with Pepperoni and Cheese Pizzas. After we headed to Daily Dose of Dunlaps house for some crazy playtime! Vinny made Principle's Honor Roll (all A's) for the second 9 weeks! Vinny's third grade class recieved many honors today, very proud of him and his class! TJ invited Vinny and I to a Christian Rock concert that he put on (sound and light), Vinny played camera man when he wasn't singing! Our team (4 Giants and a Patriot) cheered on the New Orleans Saints during the Superbowl!